OCP Group Inc of San Diego California is pleased to announce several cable assemblies design ready for the CAN II 1939/13 standard. These unique designs craft the best practices of Industrial Design with practical features that will enhance many Telemetric or Diagnostic designs. 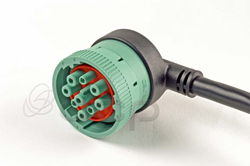 The compact 9 min connectors are complemented by unique bulk cable and over molding materials to withstand harsh environments while reliably delivering the 500 kps transfer rate specified in the new standard.